← Happy 10 Year Birthday, YouTube! A Hong Kong environmental group, in conjunction with ad agency Ogilvy & Mather HK, has developed a unique approach to end the wide-scale littering problem in Hong Kong. The city produces more than 6.5 million tons of trash each year much of which ends up on the streets and the coastline. It’s a mess, and a health issue for the Hong Kong Cleanup Initiative. But littering is a quick, solitary event and the culprits are rarely identified. That is, they have not been identifiable until now. Members of the Hong Kong Cleanup Initiative collected litter such as cigarette butts, gum, condoms, and more. Then, the trash was subjected to DNA testing, which eventually was turned into facial renderings of the trash offenders. The sample DNA provided enough information to accurately portray the eye, hair, skin, and ethnicity of culprits. 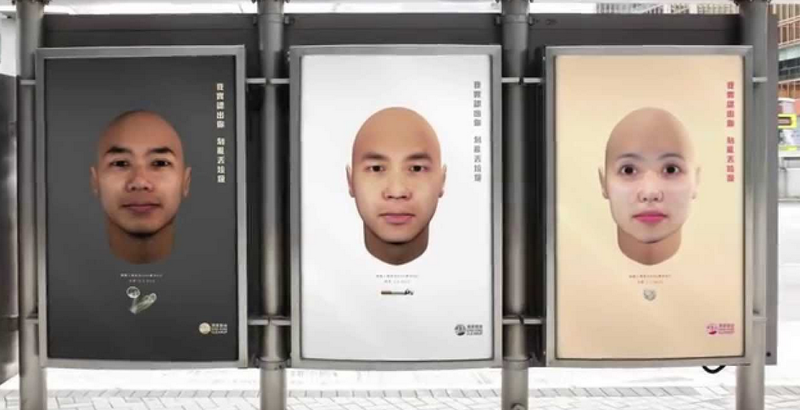 The campaign then used 27 facial composites on billboards across the city. Think again before you toss that empty coffee cup on the street. Discuss social responsibility in terms of trash and litter. What is the impact? Divide students into teams. Have each team select a public service issue and develop a unique campaign.